If there's one thing I hate, it's that awful sticky residue after you peel a label off. There have been so many times I've wanted to keep jars or bottles for craft projects but ended up throwing them out as I just couldn't get the stickiness off or I was left with cloudy glass from where that sticky residue was. Luckily, I've found the secret. I had a bunch of Stolen Recipe Iced Tea bottles that I wanted to use for a project but they all had labels - and they didn't peel off cleanly. I know the wonders of vinegar and how it can be used for all sorts of things - so I got to experimenting - and I have found the easiest way to get labels off! 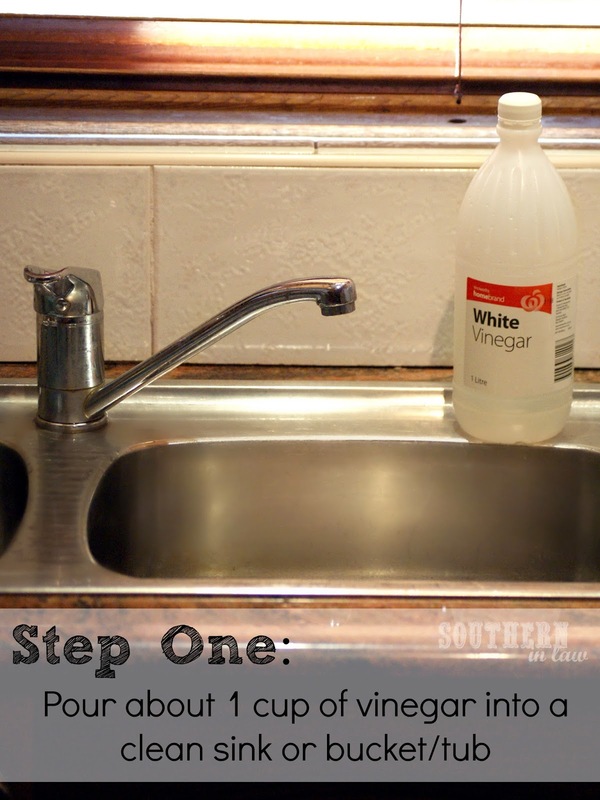 Empty out your sink and grab a bottle of vinegar. I suggest using the cheapest vinegar you can find rather than a fancy bottle of vinegar but I guess it's up to you your budget. I had a bottle of Homebrand Vinegar that I picked up for another project and poured about a cup into the sink. Now, if you have a double sided sink - run the water until it's as hot as it gets on the other side - then fill your sink with hot water. 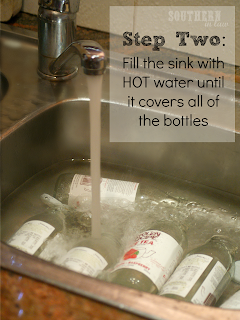 If you don't have a double sided sink, you'll want to run the water before adding the vinegar and bottles. 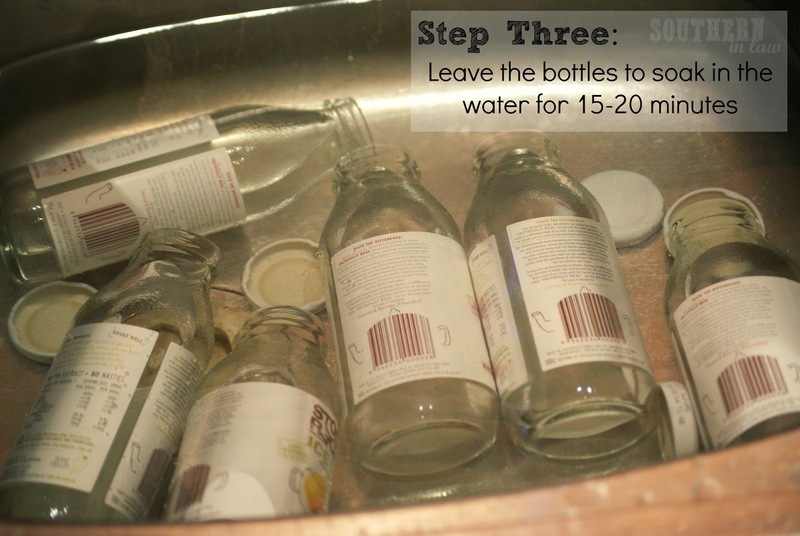 Place your bottles in the sink and run the water until all of the bottles are covered. 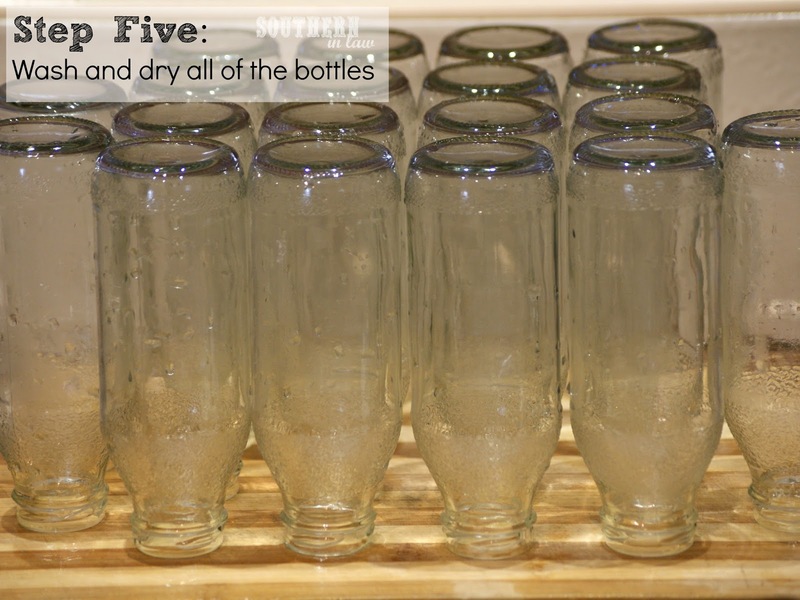 You may need to push down on the bottles to remove the air bubbles so they can sink to the bottom. If you have asbestos baker's hands like me, you'll be fine - but otherwise push them down with a dish brush or something that's going to stop you burning yourself. Once your bottles are covered with water, all you have to do is wait. I waited about 15 minutes before peeling off the labels - but it really depends on how sticky your labels are. Test if they're ready by carefully peeling a corner - if the label comes off easy, you're good to go - but if not, leave them a while longer. Once your labels are ready to peel, you'll want to do it quite slowly so you don't tear the labels. 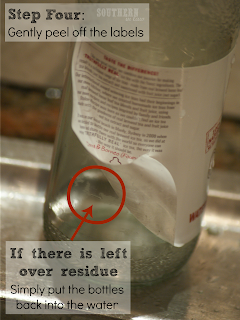 If the labels split or don't come off easily - just pop them back into the water. 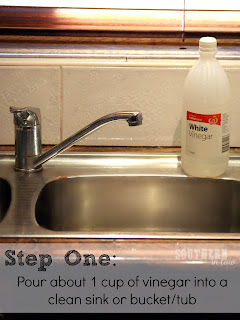 If you have any sticky residue left, you can either rub them with your fingertips under warm running water - or throw them back into the sink with the vinegar until they're easier to get off. Luckily all of the stickiness left on my bottles came off easily - either under running water or just rubbing them with a tea towel. And last but not least - you'll want to thoroughly wash and dry your bottles as vinegar isn't the most appealing smell. But tell me, what was the last craft project you did? I'm currently working on quite a few, including painting a huge canvas for our wedding reception. I will definitely be trying this! I usually just wet them and then scrap off the labels with my fingers....which is no fun and takes forever! Cheers for the tip! I totally have asbestos baker's hands too. When I have a bath I literally turn the taps on as hot as they will go and get straight in! I am feeling lots of wedding crafts coming up too and my next project is a large corkboard with pictures of me and my boyfriend from childhood until we met. Pinterest has kept me busy with so many crafty ideas for our wedding!